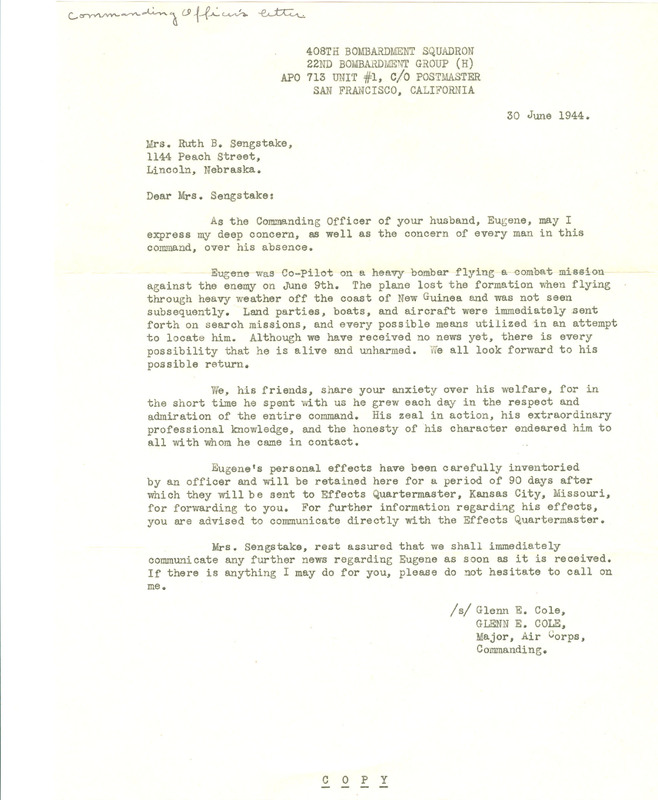 This letter from Glen E. Cole, commanding officer of the 409th bombardment squadron, described the nature of Eugene Sengstake Sr.'s disappearance, their efforts to locate him, and the location of Sengstake's effects. Eugene Wagner Sengstake Sr. of Lincoln, Nebraska, served in the 110th Medical Regiment and later as a B-24 pilot. Sengstake served in the U.S. Army Air Forces from 1941-1944, and he attained the rank of 2nd Lieutenant. His service was in the South Pacific, including New Guinea. He was killed in action June 9, 1944 between Palau and Wake Islands. 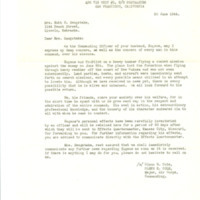 Glen E. Cole, “Letter from Glen E. Cole to Ruth Sengstake, June 30, 1944,” History Harvest, accessed April 21, 2019, https://historyharvest.unl.edu/items/show/512.